This is my final item for my 2018 Make Nine challenge (hooray!! ), and, boy, was it an epic! I had grand plans for taking loads of progress photos, but it was such an involved project, that I only took a few, then just forgot. The pattern is Vogue 7975 which is a Chanel style jacket, and I made it using the Craftsy "The Iconic Tweed Jacket" class. My lining fabric is a faux silk polyester from the sale rail in Sew N Sew in Belfast. It was £9 for 2 metres, and is red on one side and silver on the other. Here's a close up of the main fabric, and you can see that it has a little coloured thread through out it. I made a size 12, but really could have done with a size 10 for the shoulders. It's one of those patterns were the smallest envelope sizes are 6-8-10, then the next one is 12-14-16, so I couldn't blend between the sizes. And me, being me, couldn't leave the pattern as is it, and added a sleeve vent. A great thing on the pattern though was the "Petite Lines" which are in addition to the lengthen shorted lines. These were brilliant, and in my head Vogue added them for me (don't burst my bubble! ), because shortening along these lines made my jacket the perfect length. This is my traced under-sleeve, and the lengthen/shorten double line is marked L/S (because I was too lazy to write out lengthen/shorten...). The Petite lines are the two lines above it marked Petite and Foldline. I folded them up to match, and job done. The black edge lines are the cut lines on the pattern, and the red lines are my cut lines as the Craftsy class has you use a 1 inch seam allowance to allow for the fraying fabric. Not going to lie - there is a lot of hand sewing in this jacket! And it didn't help that I decided to underline my boucle; for that I used some lemon viscose voile from The Textile Centre. Then all the outside edges are stablised - the Craftsy class uses the selvedge edge of silk organza, but I used some of the selvedge from the leftovers from my Liberty silk dress, and then some light blue seam binding. These are the only progress photos I took, and you can see the lemon underlining, and the selvedge/seam binding all hand sewn on. The hems, front edge and neckline are also thread-traced to mark them. Next the front and back jacket side pieces are machine sewed to their corresponding pieces, and after this I deviated a bit from the Craftsy class. The class then has you machine the lining front and backs in the same way before quilting them to the main fabric. I didn't do this because I wanted the option to be able to adjust the princess seams at the shoulders. So I quilted the lining pieces to the main pieces without attaching any of the lining pieces together. Then I constructed the sleeves (I'll talk about this in a minute), hand sewed the side seam lining pieces together as on the class, and sewed in the sleeves. As predicted, I needed to shorten the shoulder seams and did this by taking in the princess seams at the shoulders, which worked perfectly. Then I hand sewed all the lining seams together. The sleeves are a two-piece sleeve, and are constructed by firstly sewing the longer seam on the main fabric and the lining. They are then quilted together, and the shorter seam is machine sewn on the main fabric. Finally the lining seam is hand sewn together. I think the Chanel way to insert the sleeves is to hand sew them in, but I don't trust my hand sewing to be that sturdy; so I machined them in as on the class. The main fabric hems are then hand sewn, and the outside edges of the lining is folded in on itself and sewn to the jacket. I stupidly got a bit scissor-happy with clipping into the seam allowance at the neckline, and cut too close to the thread-traced fold over line. So I hand sewed some black velvet ribbon along the inside of the neckline, and we're calling it a design feature! The last thing is to construct and attach the pockets, and add the trim. I used 2 cm wide wide stripes of my main fabric, which were cut on the straight grain, and then zigzag stitched down the middle. This made it really easy to fray the edges, and the middle didn't fall apart. I have to thank local sewing pal Jenny for that top tip! And finally, I sewed the braiding on top, and the chain on the hem. This jacket took me about two months to make, working on it off and on, and I LOVE how it has turned out. As much as I don't mind hand sewing, I can't under-estimate just how much of it there is in this jacket! If hand sewing isn't your thing, then this pattern isn't for you. And, as already mentioned, this is my final make for my 2018 Make Nine. This is the first time I've taken part in the Make Nine, and I've loved it because it's encouraged me to make some of the things that I've been wanting to make for ages. I will definately be joining in again next year if it's running, and am already working on my list. Congratulations if you've got to the end, because I didn't realise I had so much to say about this! It is exquisite Lynne. A true sewing labour of love and I love it. Thanks Ruth!!! Not sure if I want to make another any time soon, but it would definitely be quicker because I'd know where I went wrong on this one! Thanks Elaine!! I am really delighted with it, and pretty pleased with myself for finishing me Make Nine. Well done for finishing the Make Nine and what a way to finish! Your jacket is fabulous and I loved hearing about your making process. Such lovely work! Thanks Diane! I think my first and last Make Nine makes have been the trickiest. The first was the Rumana coat. I'm much happier with this coat though. Wow - it looks amazing! I bought this Craftsy class ages ago and I'd really love to give it a go. All the hand sewing puts me off a bit though too. Thanks Rachel! In fairness, I give myself more work than was in the class. It would be worth watching it through to see how much there is on it. Love it Lynne! Are you going to sit around twiddling your thumbs for the rest of the year or do you have some more sewing projects lined up? Thanks Helen!! Ha, ha, ha!! No thumb twiddling here! I have a couple of things cut out, and am currently working on the fit of something else. It looks gorgeous Lynne - well worth all of that hand sewing! 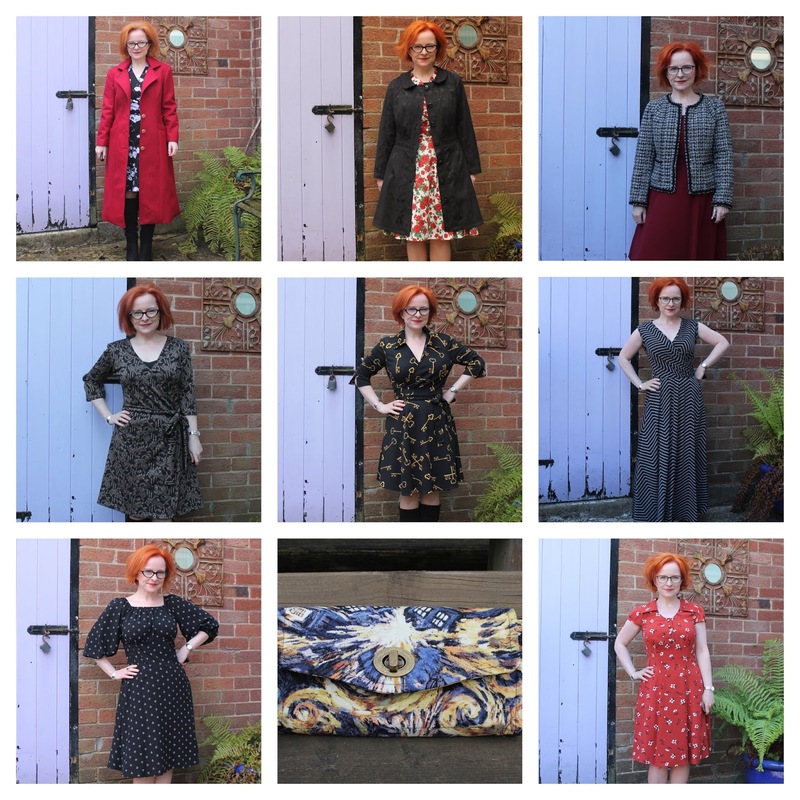 And well done on completing your Make Nine - I'm still plugging away at my list, although I'm pretty sure I'm not going to end up finishing all the projects by the end of the year! Thanks Ruth! I realised today that I have hard skin on my finger tip from the hand sewing! (I don't have a thimble that small enough). Good luck with the rest of your Make Nine. Well done on finishing your make 9! I always change my mind and don't finish so I've given up on the idea.......Thanks for posting the pics of the prepped pieces, I'm working towards this sort of jacket. I've nearly made my first lined jacket and need to bag the lining, but it doesn't have any structure or couture work like this!! Thanks Colette! I'm pretty staggered that I managed to finish my Make Nine!! As I was making this jacket, I thought it was actually a bit easier that a normal lined jacket, because there's a lot more control with the hand sewing. But it's definately more time-consuming.